Caffeine is a widely used psychoactive drug found in many drinks, such as coffee, tea and cola. Caffeine is naturally present in the leaves and seeds of a variety of plants. Consuming caffeine has significant physiological effects on your body--one being its direct effect on your heart rate. Once consumed, caffeine enters your blood from the stomach and small intestine and begins to stimulate your central nervous system. Caffeine stimulates receptors located in cells within your heart to increase your heart rate. Effects of this stimulation speed up your blood flow because of an increase in heart rate, as well as an increase in blood sugar, urine production and body temperature. Physiologically, caffeine stimulates the receptors within your heart to beat faster by blocking the enzyme phosphodiesterace. Phosphodiesterace works together with another enzyme, cyclic AMP, to keep your heart rate at its normal range. Once phosphodiesterace is blocked, the check system is no longer effective and your heart rate increases. The increase in your heart rate from caffeine consumption can take effect in as soon as 15 minutes, and can take approximately six hours to wear off. Caffeine is not stored in your body, but is eventually excreted when you urinate. 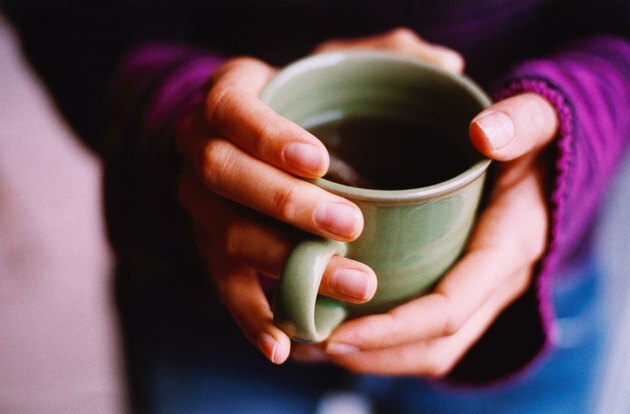 According to the University of Michigan, although sensitivity to caffeine varies from person to person, caffeine can increase heart rate by approximately three beats per minute. Athletes sometimes use caffeine to improve performance. According to the University of Washington, it was at one time on the list of banned substances for the Olympics, though the ban has since been lifted. According to Dr. Mark Jenkins at Rice University, not only does caffeine improve cognitive function and focus, it significantly improves performance during cardiovascular endurance activities, partly because of its effect on heart rate. The way that caffeine affects you will depend on your size and your tolerance. People who weigh more and consume caffeine regularly typically have a higher tolerance to its effects. If you consume caffeine on a daily basis, it will affect your heart rate less, compared to someone who consumes it once a week or even more sporadically. According to the University of Michigan, if you consume excessive amounts of caffeine, you may suffer from sleep problems because of stimulation of the central nervous system. The lack of sleep can lead to anxiety, mood fluctuations and even depression. Caffeine is addictive, and if you regularly consume it, you may become dependent on it in order to feel awake.